We covered this when Marvel teased it a couple of weeks ago, but we didn’t get an actual cover. 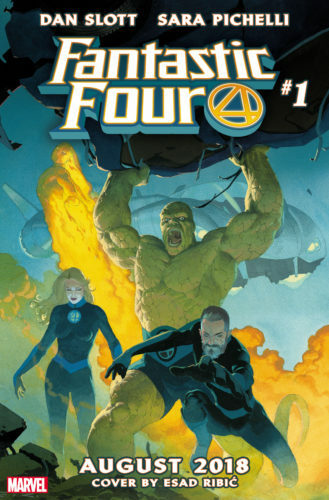 Now we have something closer to one for Fantastic Four #1, and the team looks… just a little bit different. Just a little bit. The Thing looks very Hulk-like to me. What’s more interesting in light of recent publicity for A Quiet Place, though probably coincidental, is that Reed Richards looks somewhat… like John Krasinski. Does Susan look like Emily Blunt? Asking for a friend. As for Johnny, well, as always, he’s on fire. 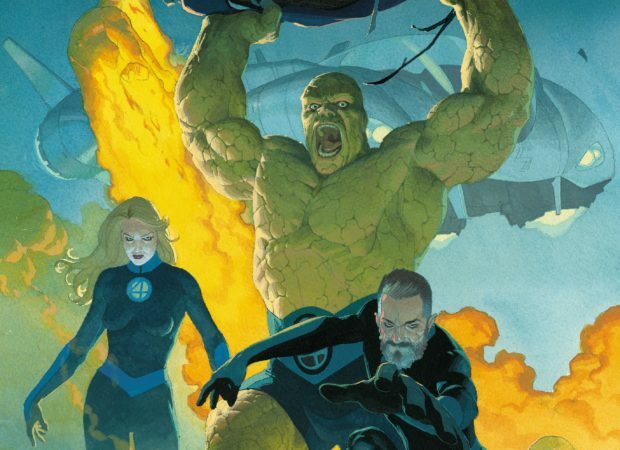 As the Fantastic Four prepare to make their return to the Marvel Universe, Marvel is proud to present a Fantastic Four teaser trailer celebrating new adventures of Reed, Sue, Ben, and Johnny! Watch the Fantastic Four teaser now! Celebrate the Fantastic Four with a view into their past and a look towards the future, from their debut in Stan Lee and Jack Kirby’s classic 1961 issue to their much-anticipated return in August’s upcoming new series from Dan Slott (Amazing Spider-Man, Silver Surfer), Sara Pichelli (Spider-Man: Miles Morales), and Esad Ribic (Infamous Iron Man, Marvel Legacy, Secret Wars)! And be sure to keep watching until the end for the FIRST exciting reveal of Esad Ribic’s dynamic and explosive cover for issue #1!